Sport divers never anticipate having trouble underwater. But when people dive too deep or go places they’re not trained to go, accidents happen. Unfortunately, divers sometimes die. 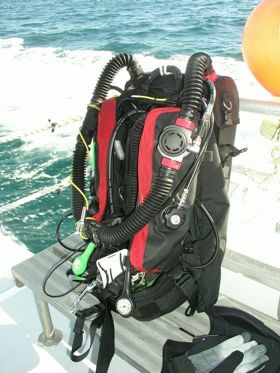 WHEN FATALITIES OCCUR under ice, in caves, or in areas requiring decompression diving, there are only a few people who are qualified to retrieve the bodies. As a regional coordinator for International Underwater Cave Rescue and Recovery, Conrad Pfeifer is one of those people. 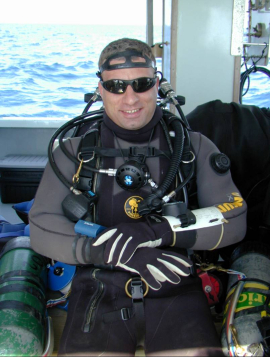 A full-time police officer in Middlesex, Pa., Pfeifer has more than 25 years of experience as a cave diver and instructor, and has participated in hundreds of safety and recovery dives. Though diving is his passion, he says that responding to recoveries is something he’d rather not have to do. Q. You’re a regional coordinator for International Underwater Cave Rescue and Recovery. What does that mean? As the northeast regional coordinator, I’m responsible for Ohio, Pennsylvania, New York, and states north of Virgina. If there’s an event that happens in my area, I coordinate the recovery. Q. Do you go on dives anymore or do you just coordinate them? I’ve been involved in many dives, but if there are local people who are trained and familiar with an area, I will call on them to go on the dive. I was involved with the Quecreek mining incident. At the time, they didn’t know whether the miners were immersed in the cave, alive, dead. So they had called us to the scene in case they needed a recovery. So yes, I’m still very active. Q. How did you get involved with technical diving and cave recovery? 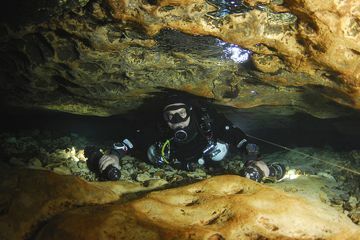 As for cave diving, I had a mentor [PADI Regional Manager Stush Doviat] who thought I would be interested in it, so in 1984 I went down to Florida, took my series of classes, and became a cave diver. Again, being the kind of person I am, I wasn’t satisfied there, so I went to the instructor level. To be an instructor, you have to be trained in recovery. Q. Do you remember your first dive when you were working with public safety? I am from Pittsburgh, and in the river they have a regatta every year. This was about 1984. My first dive was looking for this boat that was going 120 miles per hour and broke into a hundred pieces in 30 feet of water. We didn’t find anything. Q. What gets people in trouble when they dive? Eighty percent are not trained to be where they’re at. Back in the 70s, there really wasn’t formal cave training. One of the pioneers of cave diving at the time, Sheck Exley, began doing some analysis about what was killing people. The top one was that they were not trained to be in the environment they were diving in. The second one was that, even if they were trained, they didn’t use a guideline, meaning they didn’t leave the bread crumbs. They had no way to get back. The next thing he came up with was that they didn’t manage their air properly. If they were trained, did use a guideline, and had air, they would go beyond their depth capabilities. And even if they did all that, sometimes their lights would go out. Q. Do you find that those are still the top five reasons that people get in trouble? I was just talking to some of the people on the [IUCRR] board about that the other day. Training, guideline, air, depth, and lights was forever the mantra, but what we’re finding now is that there are almost two more to add. The sixth one would be solo diving. That is an ongoing debate in the dive community, but the fact remains that the majority of incidents happening now are leaning toward solo divers. The last one is really becoming prevalent and might move up the ladder: people are getting into rebreathers now. People get on rebreathers and there are electrical malfunctions, or they’re not trained on the equipment. Q. How many dives have you completed? I just completed number 3614. For recovery and safety dives, that gets into the hundreds for me. I don’t keep track of how many people I recover. I remember certain ones, but I don’t know the exact number. I was the first one who saw him be pulled off the bottom. Here’s this guy with all this training, and he’s laying on four tanks in 12 feet of water. Q. Of those recovery dives, are there any that stand out in particular? The one that’s most ironic and tragic, and is almost stupid that it happened, was when I was at a dive site where there was an entrance to a cave. This basin was about 12 feet deep. I’m getting ready to go into the pond, and this diver walks out with four tanks on. At 12 feet, that’s five or six hours of breathing gas. He jumped in the water and didn’t have his air turned on. He fell down to the bottom and drowned with four scuba tanks. All he had to do was turn a valve on and start breathing. Yeah, there are some that you never forget. Q. I understand your position with IUCRR is voluntary. Yes, I’m a full-time police officer. The IUCRR is voluntary, but in a way it is mandatory. Who else [but a trained recovery diver] has the background to get someone who has gone in a marble mine, 1,000 feet back in 150 feet of water? There just aren’t that many people with such extensive training. We kind of owe it to our community. Q. Do you think that if you didn’t feel like you had to give back to the community, you would do recovery diving anyway? Is it something you’re just drawn to? No. No, it’s not. I’m 48, so I’ve been through the 20-year-old mindset of “I have to go do everything.” I’ve been a paramedic and I’ve seen all the things out there. If I was not involved with the cave diving community or a cave instructor, I probably would not be as involved as I am, but now I’m on the board and in the law enforcement part of it. Q. What advice do you have for divers who want to go deeper or do more difficult or technical dives? I’m going to pretend that you came to me as a student, because I teach all those things. Well, let me ask you: why do you want to go deeper? My students might say they want to be—and I’m going to use this term loosely—a macho diver. They say something like “I just want to go to 300 feet.” Or they come to me and say, “I want you to train me in decompression diving.” And I think, why in the hell would you want to spend two hours in 38-degree water decompressing? I try to change their minds to say “There’s something really cool I want to see at 250 feet,” in my case the Andrea Doria, “and the penalty for that is the decompression diving.” It’s a different mindset. Q. I was wondering if you had anything additional that you’d like to add regarding your diving experience and your position with IUCRR. We wish the IUCRR did not have to exist, but it has to. We don’t want to go on a call and recover somebody and bring them up out of a cave. It is physically hard work, and it’s usually at the worst time, in the worst hours, in the worst weather. But there aren’t many people who can do that, and we kind of have to. It’s just the nature of the beast. We would be happy never to go on [recoveries], but unfortunately we probably do four or five a year. I could talk about it for hours because I love the sport. I don’t like recovering bodies, but I like to do what I do. 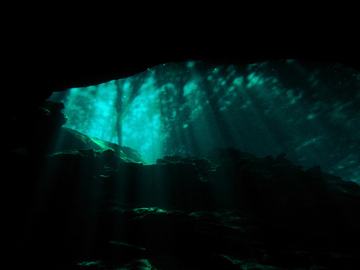 Want to learn more about cave diving? 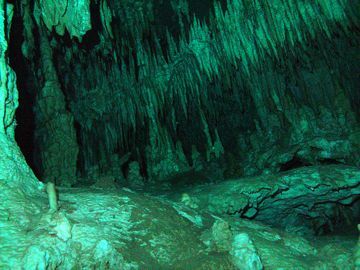 The Nation Association For Cave Diving and the National Speleological Society both organize courses and offer information on the sport. Find more articles about accidents and how to prevent them on Matador Sports.